So how did this sea leveler content at 8,800 ft. Run the Caldera? A bit better than average. 89th runner out of a total of 222 male/female. Next year will be much better! Last week during the mountain run with my buddies, one guy said, while laughing “Get ready for your first 2.5 hour 1/2 marathon.” I thought he was joking, how in the world could it take 2.5 hours to run 13 miles?Well today I can tell you. 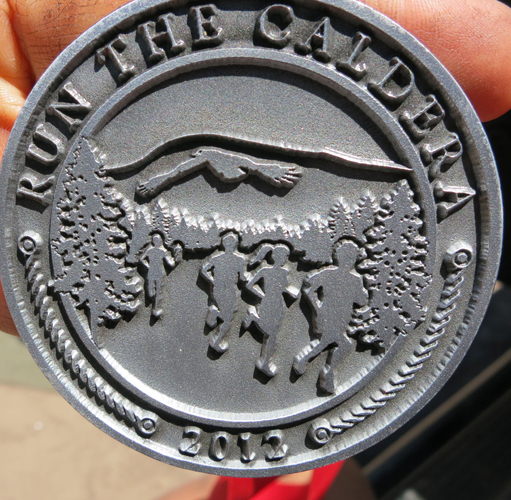 I was excited to “Run the Caldera”. In case you don’t know, a Caldera is a collapse of land following a volcanic eruption. Each year there is a 10k, 1/2 marathon and marathon. The actual race, at least the 1/2 does not go into the Caldera but rather it is run in the mountains, beginning at 7,853 ft and going to 8,857 ft. I checked out the times from last year, to see who the competition was. The fastest woman was 1:45, the second fastest 2:01. The fastest man 1:39 second fastest man 1:47. The fastest woman in my age group ran a 2:18. Wow, I thought, this is really slow. I should do okay; my last 1/2 was 1:44 on the road, and so on the trail I figured 2:00 or 2:10. I failed to look up who these people are, only their times. Boy am I naive. I scouted the start the day before. It is 63 miles from home and I wanted to make sure I got there on time. It was a beautiful drive that goes through the slightly creepy slightly intriguing Los Alamos. It only took 1.5 hours to get there and was easy to find. Race morning I woke nauseous and with overactive intestines. I could not eat anything and was most worried about dehydration. I woke several times during the night with a dry mouth but I continued to drink electrolyte water, maybe too much electrolyte water. In the morning I ran the dogs, got dressed and was out the door. I felt better during the drive. I arrived five minutes after the marathon, and had just under an hour to wait for my start. During that time I ate a banana, went to the port-o-john four times and jogged for about ten minutes and did a few drills. At the line up, everyone stood around casually. The only people to go right to the start line were Los Alamos Cross Country high school boys. We were given directions that we would run on logging roads, over a substantial amount of grassy fields without any trails, up extremely steep inclines of soft sand and rocks and over rivers. He forgot to mention though a field of prairie dog homes with random big holes. I had been forewarned to walk the hill and that I will catch back up to the people who tried to run them, and that was my plan. I started easy and slow, taking my time. My first mile was very slow, a 9:44 but by mile 4 my overall average was 9:15 as I was able to speed up to 8:00. I thought if I could average 9:15’s miles give or take I could finish in around 2 hours. Then the big hills started. In the next two miles I climbed just under 1,000′ and was at 8,857′ of elevation. Mile 6 and 7 took me 13:30 and 18:21. The hill was so steep I was almost on my hands and knees. The ground was soft sand filled with rocks. It was a slow going but with awesome views of the mountains. For the next two miles the decent started but my technical downhill running on rocks and soft sand is not good so I was not able to take advantage of it. In mile 10 I went back up 254 feet. And speaking of feet, mine were killing me! I have to buy trail shoes. The bottoms of my feet hurt, my hips hurt, my quads hurt, everything hurt and I was alternating walking and trotting. I met lovely women from Albuquerque. She talked about the trails in ABQ and invited me to come down. I passed her on the downhills but she later caught up with me on the grassy flats and took off. I could not catch her. In the last mile I promised myself I would only run, no walking. But when faced with another 105 foot uphill I walked. I just couldn’t take it. Then I looked at my watch. In 4 minutes it would be two hours and thirty minutes. I had about a half mile to go. I had to do it. I picked up the pace, I passed two people, then I passed another guy, suddenly I saw the little house on the opposite side of the start, I ran faster. A guy hobbling on the trail stepped aside. A crowd cheered and a guy yelled,” that is the way to finish it. ” He must be talking to me, I thought. I pushed harder. My legs got going, I passed 5 people, and I saw the clock and finished with 30 seconds to spare. My lungs felt like they had stuck together. I crossed the finish line and had the same feeling I had when I fell off a tire swing flat on my back as a kid and got the wind knocked out of me. Luckily it only lasted a couple seconds and I was handed my shiny new metal. My fastest pace on the last mile was 6:39. The final results are not posted but I know was lower than 24th woman and beyond 4 in my age group. There are a lot of super athletes and ultra runners there. A woman who ran the 2004 Olympic marathon trials won the marathon. Once I know the full results I will post them along with the pictures. 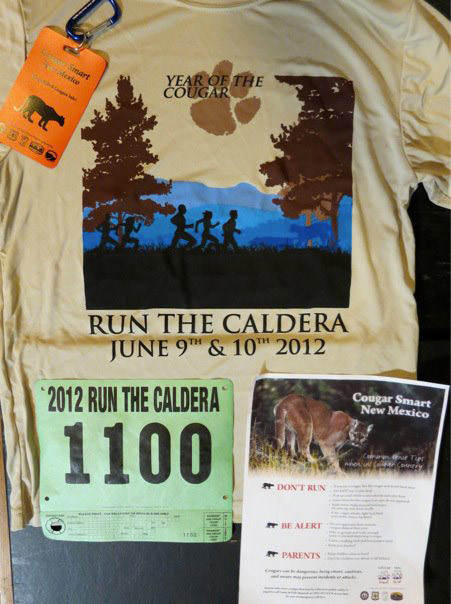 It is almost Cougar Time, I mean Run the Caldera, time. I picked up my gear on Wednesday from the SF REI. I also did a bit of shopping, a few pairs of socks, a new bike pump, some honey stingers. They gave us cool shirts and carabiners with cougar safety information. I now know not to run if being chases by a cougar and that if it attacks me I should fight hard with sticks, stones, and a backpack. Just don’t play dead. What animal is it that you play dead with, a bear? Geeze I hope I don’t get my behaviors mixed up. Tomorrow I am doing to do a trial drive to the race start. It is about 1:45 away but I do not want to get lost Sunday. More driving but a greater peace of mind at 5:00am Sunday. I am finally coherent enough to write about yesterday’s trail run. Twelve of us drove to Rio en Medio which is a lovely uphill streamside trail with several waterfalls. This trail is lower elevation that last week, it starts at 7200 and goes to 9200. We stayed lower because of snow problems from last week. Since this is my one week at altitude I expected things to be a bit tougher than last week. Everything that I had read points to week 1 and week 2 being the hardest. I still have elevation insomnia. Normally I sleep hard as a rock for a solid nine hours, but here I fall into an exhausted heap about 8:00pm, and wake up at midnight, toss and turn for a while and then sleep until 5:30 or 6:00 and get up. I can’t wait for this to pass. We began the lovely trail run and it was fairly easy going, but when we made our first stop at a steam crossing one mile in I was happy to catch breath. I am pretty sure it was a Garmin malfunction but it said my max hear rate in this first mile was 236, you laugh but then in mile 2, my max was 232. My average was 179 for those miles. While it was not super steep in the beginning it was steep and to give you an idea about HR, pace, and stress of environment/landscape. Mile 1 was 11:51, mile 2 13:24, and mile 3, 18:49. And even on mile 3 my max HR was 165, with an average of 151, normally 151 is an 8:45-9:00 on the road. By the fifth mile the ground had leveled out and we were running 9:00’s and my HR continued to drop. The slow paces was also due to stopping to get everyone over the stream. At the fifth mile there was a critical decision. We had two options, either go back the way we came, this would be a downhill run and rock scramble for 5 miles, or, continue on and the trail would turn into a dirt road leading to Aspen Ski Basin and down around to Chupadero. If we continue on it would be 10 to 13 more miles. My first instinct was to continue on into the unknown making this a 15 – 18 mile run instead of a 10 mile run. I had a sneaking suspicion Maryann, the super strong woman from last week just might join me, and sure enough, both she and Andy said yes. This was a good thing since we came in a car together. I guess “like” personalities do bond! I only had about 5 oz of Gatorade with me so I had to ration. The dirt road was totally exposed to the sun and downhill. After last Sunday’s 5 miles of downhill I took it easy. I had DOMS from last week and I did not want that happening again especially since I have a race this week. Andy and Maryann were about 20 meters ahead of me. The first five miles were around an 8:00 pace which was a good relief from the slow hill climbing. But about the 6th mile the sun was beating down on me, the hills were moving up and down and my groin started to ache forcing me to take it even more easy. I ran a couple of easy 9:00 miles. Toward the end with 2.5 miles to go the dirt road ends into asphalt pavement. Maryann and Andy waited under a shade tree for me and we were all out of water. Just then super runner Eric came driving by in his car. ( Eric was in the 1996 marathon Olympic Trials-he is a super runner) He finished the 5 mile return and was heading home. We asked for a ride back, half joking and half serious, but we could not bribe him to drive the steep hills back. We asked for water and his companion had half a liter that she gave us. But I guess our fumbling became apparent and we were aware that Eric was studying our faces to see if we were able bodied and coherent enough to finish the trek. Apparently we passed. The splash of water and the hard road brought my pace back down to 8:00 but not for long. I looked ahead and all I saw in the horizon was a giant hill. I could not even see it’s end, it must have been 2 miles long and straight up. I remembered our car having a hard time climbing it. I started the second to last mile at a 7:50 pace but it eventually turned into a walk, making it a 12:00 average. I caught up to Andy who was a ahead of me and for a short while we walked, then we would say, “let’s run to that sign,” which was maybe 50 meters way, but eventually Andy said “no”and I stopped too. Maryann was waiting for us on the top of the hill, none of us were sure where our cars were at that point and we were all kind of foggy. The final .86 of a mile was terrible. We walked. We were overheated, without water, exhausted. I had nothing left, absolutely nothing. I could only walk. It was not like I was sweating and tired, llike after a race, but I was beat like after running a hard marathon. The .86 was at a 14:00 pace, a walk. With less than 200 meters to go, Andy said, “let’s jog.” Oh it was hard to start but then it felt pretty good. There were four runners waiting for us and clapping. The 5 milers finished not too far ahead of our 10 miles, their terrain was much harder. We rolled in and Jim instructed us to drink one bottle of water then Gatorade. We would have done anything we were told. Jim always has an ice cooler filler with water and Gatorade and a box of peanuts, mixed fruit and nuts, cookies, and other treats in the back of truck for the finish. Maryann and I squatted on the ground to stretch both agreed that we would do nothing for the rest of the day. My brain was shot. I drove the hour home, got the dogs and went to Abiquiu Lake to cool off my legs. The lake was cold and refreshing and did wonders for my aching hips. In the last two weeks I have done an astronomical amount of downhill running, easily about 15 miles. And while 15 miles may not sound like much, I am not counting the up and down hills, I am counting deliberate non-stop straight downhill running of the 5 miles last week and almost 10 this week. There is nothing more damaging, to me at least. I could not do anything for the rest of the night. I could barely figure out what to make for dinner and my stomach did not want any food. It is the same feeling you get after a totally exhausting marathon where you also took in caffeine and your digestive system shuts down. You are exhausted, strangely alert, but can’t respond to anything. I had no caffeine and only ran 15 miles, but I ran for 2:40 with 10 miles in the blazing hot sun. Was I wrong to pick the long route? No way, the three of us had a blast and I would do it all over again! I have been in New Mexico for one week now. It is hot and beautiful. I just came back from checking out some second hand stores in Espanola, “Lowrider Capital of the World,” where it was 95 degrees at 7:00pm. My number of running days slacked off, but the intensity is there. As I said in my last post I had a super fun mountain trail run Sunday and last night I met the Striders for a Thursday night tempo run. So this is always interesting. It is the same 5.9 mile course that runs through the center of Santa Fe with the first four miles graduating going up and the last two miles gradually going down. About half the run is on dirt roads. It is a great course, but brutally hard in the 4th mile. It only goes up 350 feet. We start at 6,939 feet and go to 7,226 feet. I wrote about this year. A normal tempo run for me would be about 7:40ish on dirt in Central Park and last year the fastest in New Mexico, meaning it was more like race pace because it was the fastest I could run this was 8:45. So I am either more fit and or faster to adapt to the altitude. My average pace yesterday was 8:38, but it was honestly all I could do. My heart rate averaged 166 with a high of 172 which is closer to my 5k cross country at altitude or 15k cross country at sea level. Hum, wait that does not make a lot of sense. Next week I will start the tempo slower and run it as a real tempo and not worry about the time. Besides running I spent 12 hours weeding my 2 acres of sand and thankfully hired a terrific guy to help me. I I brushed on three layers of lineed oil on to the 675 sq ft adobe studio floor. I off-loaded two printing presses, which is a story unto itself. The mover made it 100% more difficult than it needed to be. I took the dogs swimming twice, got a new roof on the house, bought some new studio furniture, drafting table, chair, desk, and assorted stuff second hand shopping. Ran the trails behind my house. Had dinner with my best Santa Fe friend and hiking buddy and finished my end of a three year outcome assessment on teaching report for the university and several other assorted household chores. I would say that is a pretty good week. Sunday I am meeting the Striders for a 10 mile run on the Rio Medio trail. There is a beautiful water fall along the way. This is a lower elevation run because there is too much snow higher up. We will go from 7200 to 10,000 feet. I will report back after the run.